The USB-4X-RS232 USB to serial converter is designed for PC, thin client, or server to provide instant COM ports expansion via the Universal Serial Bus (USB). Great solution for the addition of new RS232 communication ports for newer PC or Laptops. Serial speed supports 1.2Mbps and 256 byte transmit and receive through all ports. System recognition of the Serial Box with no conflict. The USB-4X-RS232 USB 4 Port Serial DB-9 RS232 Adapter provides a scalability and interface that is designed to quickly and efficiently adapt to new USB technologies. Multiple modules can be added to a single USB host interface allowing you to add WAN connectivity as needed. With the USB Plug-and-Play feature, simply plug in, follow the instructions of Install Wizard, then you are done. You don’t have to deal with Card Slots, I/O address, IRQ jumpers, DMA and others when you are connecting the devices. The System will recognize the device and install the drivers automatically. 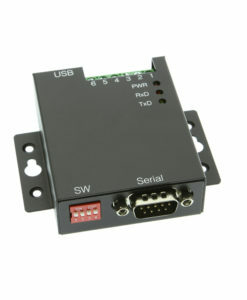 The USB-4X-RS232 is an ideal solution for your expanding applications. USB Port: Fully compatible with USB1.1 and Forward compatible with USB2.0 Serial Ports: Supports 4 DB9-Male UART Serial ports. Provides 4 Serial Ports over USB Port. Easy Serial Port Expansion over USB Port. Supports Serial Speed up to 1.2Mbps. 256-byte Transmitting and Receiving Buffer. USB1.1 and USB2.0 Backward Compatible. Provides Detachable Wall Mounting KIT. DC Jack for Optional DC 5V Power Input. Power Requirements: Normally Power solely from USB Bus, no external power supply needed. 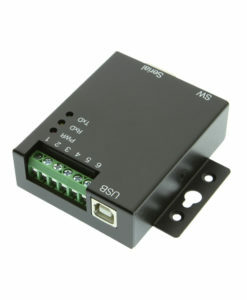 A DC Jack Input available supports power over DB9-Male applications.